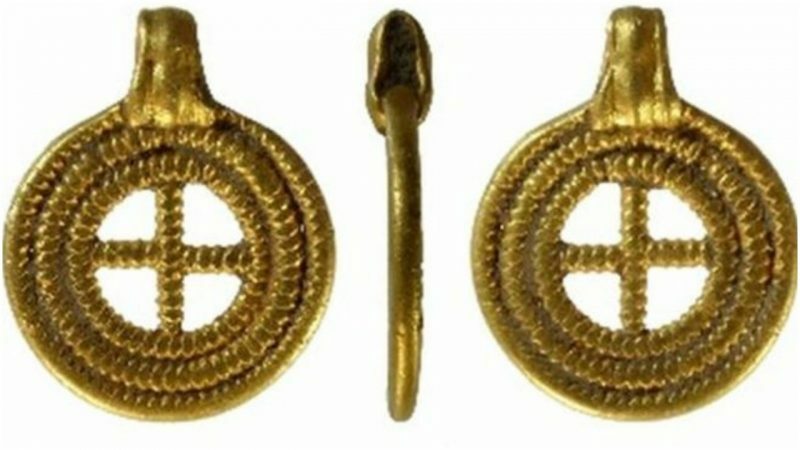 A gold Anglo-Saxon pendant, found in Norfolk, England, has been declared to be treasure, according to the BBC. This means that it legally belongs to the Crown, rather than to the individuals who discovered it, and will now be valued according to the Portable Antiquities Scheme. The pendant was unearthed in 2017, close to a site already made famous for its archaeological riches. In 2014, a collection of Anglo-Saxon jewelry was discovered in a 7th century grave near Diss, Norfolk. 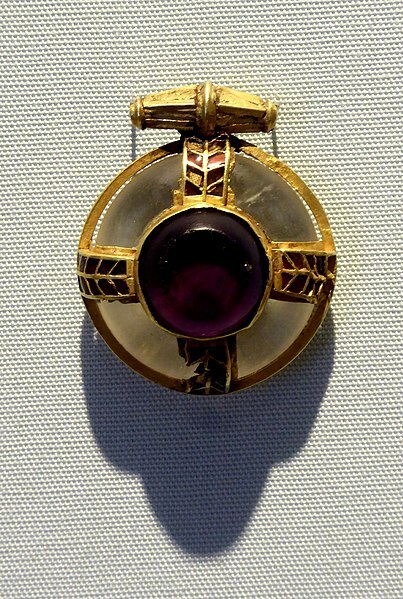 According to the BBC, among the finds was a gold pendant fitted with garnets, thought to have belonged to a high-status Saxon woman. This object, known as the Winfarthing Pendant, was discovered by student Tom Lucking and is valued at £145,000. It was recently displayed at the landmark Anglo-Saxon exhibition at the British Library, “Anglo-Saxon Kingdoms: Art, Word, War”, and is said to have national historical significance. Like the Winfarthing Pendant, the latest find in Norfolk is also thought to represent elite Anglo-Saxon culture. The pendant is made of gold, punctured by a cross motif, and measures 17 mm by 13 mm. It is extremely fine work. 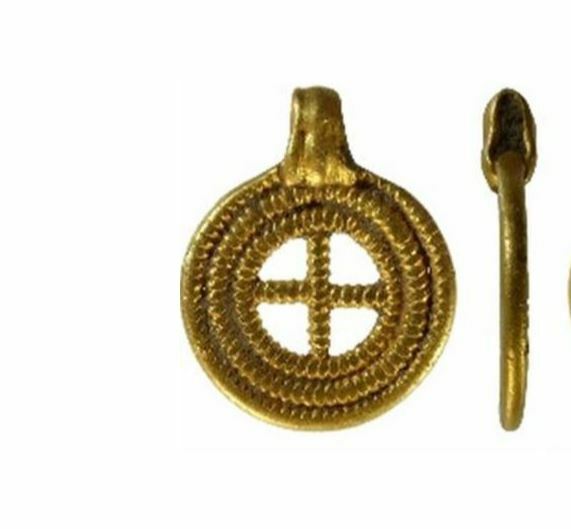 Like the Winfarthing Pendant, it is thought to date from the late 6th to mid 7th century, a period of significant change and development in Anglo-Saxon society. Finds of these kinds are not uncommon in areas of Norfolk, and many Anglo-Saxon graves and hoards have been discovered there in recent years. 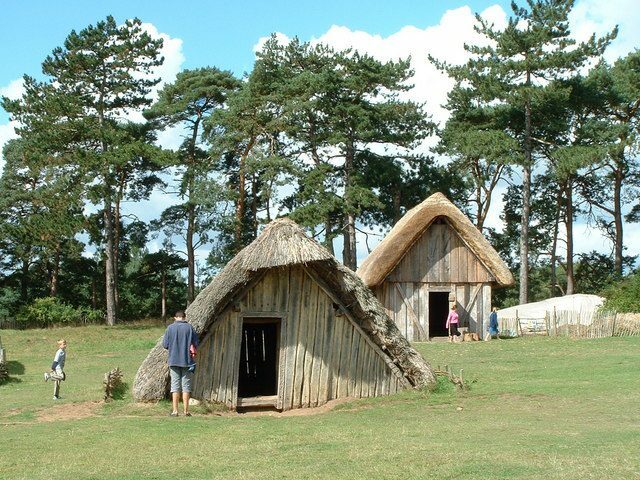 High-status members of society were often buried with expensive goods, and these items can offer fascinating insights into Saxon workmanship, technology and elite culture. During this period, according to Shoemark, only women tended to be buried with large amounts of jewelry, and therefore finds such as this pendant offer tantalizing details about the social status and role of women in society. That the find has been declared to be treasure is also particularly significant in determining what happens to it next. According to the Treasure Act of 1996, anyone in England, Wales or Northern Ireland who finds an object that may be defined as potential treasure must report it to their local coroner’s office. 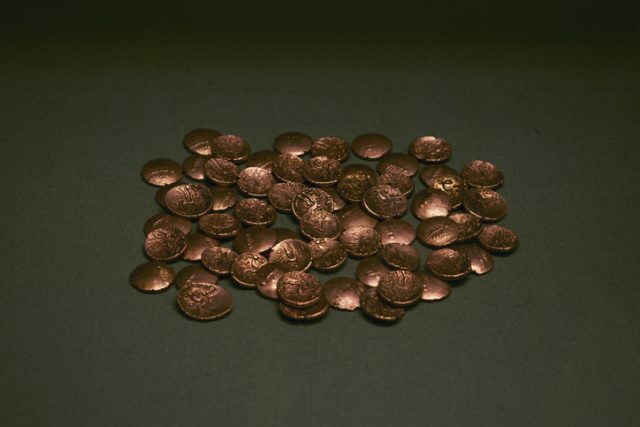 Treasure is classed according to a series of complex definitions and may include sets of gold and silver coins over 300 years old, objects made of gold or silver that have been deliberately hidden by their owners, and prehistoric items. Once a find is declared to be treasure, it must be valued by the Treasure Valuation Committee of the Department for Digital, Culture, Media and Sport. If it is found to be treasure, and hence falls under the jurisdiction of the Crown, it must be offered to museums for purchase. If no museums are interested in the find, the finder may retain it. If it is acquired by a museum, the Treasure Act allows for a reward up to the market value of the item to be divided between the finder and the owner of the land on which it was found. The Treasure Act is designed to ensure that objects of historical and cultural significance, such as the gold Saxon pendant found in Norfolk, are able to be acquired by museums and made available for further study and public display. This important piece of Anglo-Saxon history will now be valued and offered to museums, in the hope that it will further our understanding of the material culture of this fascinating period.